Posted under Health Guides. Updated 7 March 2017. The four main types of fat found in food are monounsaturated fat, polyunsaturated fat, saturated fat, and trans fat. Most foods have more than one type of fat, but in different balances (or amounts). 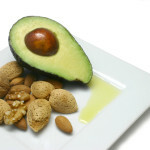 Monounsaturated fat is a “heart healthy” type of fat. Research shows that monounsaturated fats may help to decrease LDL (“bad”) cholesterol and increase HDL (“good”) cholesterol. Nutrition Tip: Try to increase your intake of monounsaturated fat. Polyunsaturated fat is also a “heart healthy” type of fat. There are two essential fatty acids (linolenic and linoleic) that your body uses to make substances that control blood pressure, blood clotting, and your immune system response. Linolenic fatty acids are a special type of fat called Omega-3 fats which are known to have many health benefits. Nutrition Tip: Try to increase your intake of Omega-3 fats. Saturated fat is also called “animal fat” because many of the richest sources of saturated fat are from foods that originally come from animals. Although your body needs a little bit of saturated fat to stay healthy, eating too much saturated fat may increase LDL (“bad”) cholesterol. Nutrition Tip: Try to decrease your intake of saturated fat. Trans fat is formed when liquid oils are made into solid fats. Trans fats are made artificially by food manufacturers. They were originally thought to be the healthier option to replace saturated fats, but research shows that they’re by far the least healthy type of fat. Trans fats increase LDL (“bad”) cholesterol and decrease HDL (“healthy”) cholesterol and should be avoided. Nutrition Tip: Try to do away with trans fat in your diet. Because there are many health benefits that come from eating fat, there’s no need to follow a low-fat diet. The key is to choose mostly healthy types of fat. About 30% of the energy we eat should come from fat. The rest of your energy should come from a combination of carbohydrates, including fruits and vegetables, and protein. What are some alternatives to saturated or trans fats? Instead of using butter for cooking or spreading, try using olive oil or spreadable olive oil. Choosing leaner types of protein such as beans or white-meat chicken are good ways to decrease eating saturated fat found in red meat. Cholesterol is a fat-like substance that’s found in animal products and is also made in your liver. Your body needs cholesterol to make hormones, vitamin D (which is important for healthy bones), and bile (which helps your body use dietary fat). There are two types of cholesterol: HDL (commonly referred to as “good” cholesterol) and LDL (or “bad” cholesterol). Dietary cholesterol comes from the foods that you eat. It’s only found in foods that come from animals, such as eggs, meat, fish, dairy products, and butter. It’s also found in foods made with butter, including cake, cookies, and muffins. Fruits, vegetables, and grains don’t contain cholesterol. Blood cholesterol can be affected by the foods you eat and your fmaily’s cholesterol history. Your body naturally makes cholesterol. The amount of cholesterol that is found in the foods you eat is different from the cholesterol level in your blood. Eating foods high in saturated fat can increase the cholesterol level in your blood. Your medical provider may check your blood cholesterol to see if you’re at risk of having heart disease or have a family history of high cholesterol. To see a list of foods that can potentially raise your “bad” cholesterol, see the saturated fat table above.